Recently, my neighbors sold their house to a businessman who decided to turn their home into a deluxe BnB for tourists visiting provence. After months and months of work, the place looks lush and extravagant... to the point where it's excessive. The emerald green lawn looks stunning, but the water requirements out here in this climate are over the top. However, this hotel isn't just wasting water - it's wasting another kind of resource. 23 halogen lights are set up in the 20 square meter parking area. One light per square meter. Our pitch black night has become so bright I can actually read a book in my room by the hotel's lights alone, and the stars... well, suffice it to say, the budding astronomer can't exactly do her own observations anymore. Not many people tend to realize that light is something that can be wasted. 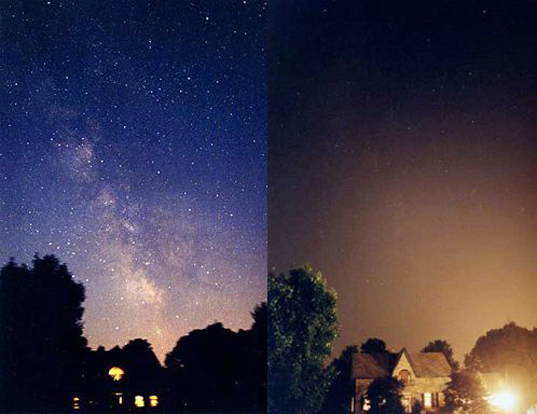 That there is such a things as "light pollution". This form of pollution is defined as some form of artificial light intruding on natural areas. The problem is that the light is not focused on where it needs to be, and is wasted, shinning upwards where it benefits nobody. Large cities are so bright, for example, that from miles away you can see the orange glow of their street lights. You may not even notice how much of a problem this is if you're living in the city. If you want to know just how bad it is, look outside in the middle of the night and tell me how many stars you can see - if you can count them on your hands, it's a problem. Living in the country as I do, I tend to forget how rare it is to have a clear sky these days. Before the hotel arrived, I could just make out the milky way. Now I'm lucky is I can make out full constellations. There's a story that gets told over and over again to make us laugh, which happens not only to be true, but to have happened many times before. After power outages in major cities, the police will get many "emergency calls" about "strange lights in the sky". for the most part, these turn out to be... the planet Venus. Have we come so far as to forget there are planets int he sky above us? At this point, you may be thinking that light pollution is more of a sad inconvenience rather than an actual problem. And yet, the consequences of these artificial lights are drastic. It disorients nocturnal animals, sometimes luring them to roads where they are promptly run over. They blind and confuse insects which pollinate nocturnal plants - without them, these plants can no longer reproduce. Migrating birds get led off course. And if that hasn't worried you, think about how many mosquitos we'd have if bats can no longer hunt them! It also has severe health effect for us humans: Light pollution can interfere can prevent the production of melatonin, the chemical that regulates sleep patters (the lights aren't just keeping you from falling asleep, they're keeping your body from regulating your sleep!) and low melatonin levels can lead to... Cancer. But the thing with light pollution is that it's an easy thing to reduce. For starters, lights don't always need to be on - turning them off when you're not using them is the basic place to start. But then, you may say, what about safety? What about lighting our streets so that we can walk without being in the dark? Well, let's look at the lights we are using. They light everything around them, like an orb - but nobody is able to levitate, as far as I know, so all the light going up is wasted. Which is why switching to downward facing lights is an easy decision. You can also combine that with lower wattage bulbs, like compact fluorescents; that will even save you money! It's pretty easy to make a change when you're getting money out of it. Please write to your local government about changing street lights to lower wattage downward facing lights. It's a good environmental - and economical! - change, which will provide lasting benefits. Think of your local Astronomers! Check out the International Dark Sky Association's website to find out more about how you can prevent light pollution. And for more on how it affects us and the environment, check out National Geographic. This is not art. But it's fun. Losing weight... let's cut the crap. Let's Make Bacon Maple Ice Cream!